Raleigh’s position as as the social political center of North Carolina for more than two centuries has been challenged but never surpassed. Great movements of people and ideas, some not so pleasant, have been a part of the capital city since its founding. Our somewhat odd, self-assured little city has been the scene of triumph and tragedy, parades and invasions. Through most of it, Dorothea Dix hospital aka “Dix Hill” has provided what many would submit as a touchstone of a civilized society, a presence whose existence was just one facet of a crusade that originally moved the itinerant spokeswoman for the mentally afflicted to alternately shame and cajole state legislator until they were moved to found the institution. Dix’s simple plea/demand rested on a central pillar that no place that considers itself civilized can be truly judged so in the absence of proper medical treatment for all its people. Prior to Dix’s appearance the mentally/neurologically challenged had an (especially) tough row to hoe. Derided, rejected and scorned by polite society, those lacking a support system who were afflicted by maladies other those of an obvious physical sort were mostly on their own. Contemporary mores and fears of the unknown set a pattern of removal and incarceration in places of punishment and separation, often jails or prisons where abuse and physical punishment were what passed as normal practice. Needless to say, the problems created by the pattern exacerbated the toll on incarcerees and on society both in spirit and cost to the public. Today, our supposedly mature, enlightened society is witnessing an unfortunate shift, a reversion to the patterns of the past. I live in Boylan Heights, the neighborhood whose location affords a splendid view of the backsliding we as a society seem to be facing. I have been here off and on for decades and have utilized BoHo’s location as an easy laugh line that provided adequate directions for many visitors: “between the penitentiary and the nut house,” a good-natured jab that has lost most of the humor and serves solely as a locational cue. The mile post was set when a new Department of Corrections prison hospital and psych unit began to rise mysteriously unannounced from the earth oddly concurrent with the public announcement of the final closure schedule for Dix. 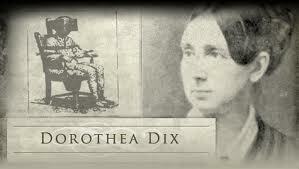 Suddenly we began to witness the undoing of over a century of the enlightened goals of Ms. Dix as well as society. Possessed of a juxtaposition far to too tragic for inclusion in the irony column, the region’s sole source for mental emergencies and ongoing care for those with head problems is seemingly to the casual observer being literally replaced locally by an institution that bespeaks what Dix dedicated her life to altering, a place whose institutional core screams punishment rather than treatment (although I am certain that the state has all manner of figures and verbiage lined up to dispute that.) The obvious is extent in an unintended (one would hope) psychological message backed by physical reality. This is serious stuff, y’all. DHHS’s decision to move the remaining patients and employees will strike a blow to the heart of the area, not just to the patients but to the very gestalt of Raleigh. It has been some time since “Dix Hill” set aside days to allow the more functioning patients out to wander around the city but even with that absence having all types of people contributing, even unconsciously, to a society is one central icon of what a fully balanced society should strive for. See, I have a special interest that transcends matters of geography and real estate. I am one of the tribe now. In Dorothea Dix’s time the seizures, visions and, um, notions that are artifacts of my nearly fatal traumatic brain injury 5 years ago would have given good reason for me to be up on the Hill. Even though changes in assessment have (perhaps) denied me qualification (technically) as a “nut-job,” I feel a sense of solidarity and unity with those who do. And were the balance tipped further to the degree that I required hospitalization, the thought of being exiled to the wilds of Granville county at Butner does not engender healthy, positive feelings. Just the presence of others in ones own immediate vicinity engenders constructive, healthy feeling of inclusion, both for patients but more, for the city. Everyone deserves a seat at the table of society instead of exclusion and segregation. The choice and results are stark and present. I won’t even go into the money involved, something that should concern those paying for it, the taxpayer and those with their hands on the purse strings, legislators and administrators. This is an issue that could serve to form a bridge amid this fractious, politically hysterical milieu.